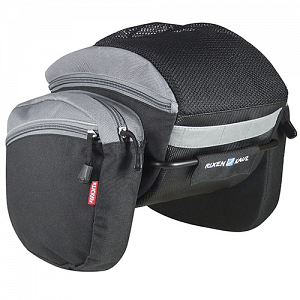 Contour bags were developed for bikes without a rack. They offer lots of space as well as good protection against dirt and water. Elegant, comfortable bag for day-trips. Large side bags with zipper and additional compartments, on one side with net. Main compartment with 2-way-zipper, small compartment for valuables on inner side of cover. Bottom made of easy-to-clean vinyl material. Rear side with reflector and light holder. Thanks to the twin aluminum frame, Contour Max bags are able to bear a greater amount of weight than regular Contour bags. Additionally, Contour Max bags provide good protection against dirt and water. This bag comes with an adapter that fits all common seat posts, so that you can enjoy all "Contour" bag advantages even on bikes without carrier. With just one click, the bag automatically locks into the adapter. Press the red button to release. Comes with two clamps for Ø 25-28 and for Ø 28-32mm.